Born 6/14/92. 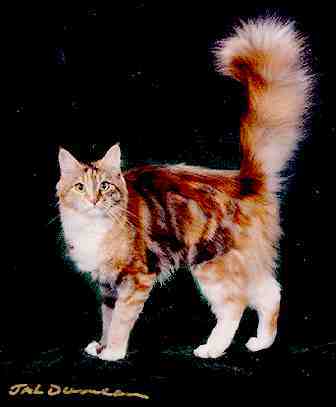 TICA's best brown classic torbie and white MC in 1994, and the NW Region's 14th best LH cat. Chutzpah is a large female with good boning and a long, hard body. Her coloring is rich and flashy and her coat, while not exceptionally long, feels wonderful to the touch. Chutzpah has a beautiful head much like her brother Pepper's -- long square muzzle, perfect profile, and deep square chin. Her ear set is excellent and her ears are good-sized, with nice lynx tips. Her hips are good and her heart is sound. She has a terrific show personality -- easygoing and a real showoff. At home, she's a "front and center" kitty -- she wants to help with everything; she is friendly, fearless and a great "greeter cat". Every lap belongs to her, and every human is a potential friend and admirer. Chutzpah is now retired from breeding, is spayed, and lives happily with her very own human, Don Lee, in Florida -- not too far from her youngest son Jefferson. To see photos of Chutzpah's last litter, click here.